Westminster Folding Chairs are known for durability, stability, comfort and the unbelievably smooth, sanded finish. We use thick cuts of teak wood and precision engineering to ensure that our chairs sit flat, with no wobble. Suitable for indoor, outdoor, residential or marine use. All of our teak folding chairs arrive to you in their natural, smooth sanded state. Finishes Available. This was one of the best shopping experiences we've had! Our sales associate was knowledgable, helpful, and so patient. After much research and thought, we purchased the Veranda Grand Table, 6 side chairs, and 6 folding chairs. Our furniture arrived just three days after we placed the order! The way it was boxed and crated was impressive. I think it took longer to get it out of the crate than it did to put it together! The assembly directions were easy to follow and the joints fit together perfectly. The quality of the teak is unmatched. All future outdoor furniture purchases for our family will definitely be from Westminster Teak. We appreciate your commitment to excellence, both in product and customer service! All my teak furniture came and I love it! 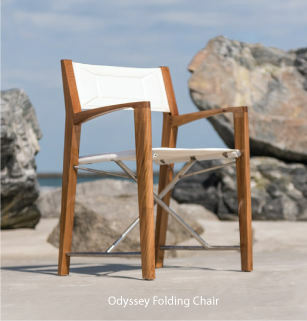 The teak folding chairs are remarkably comfortable even without the cushions. I was already happy with my purchase, and now I'm happier. You couldn't ask for better customer service!